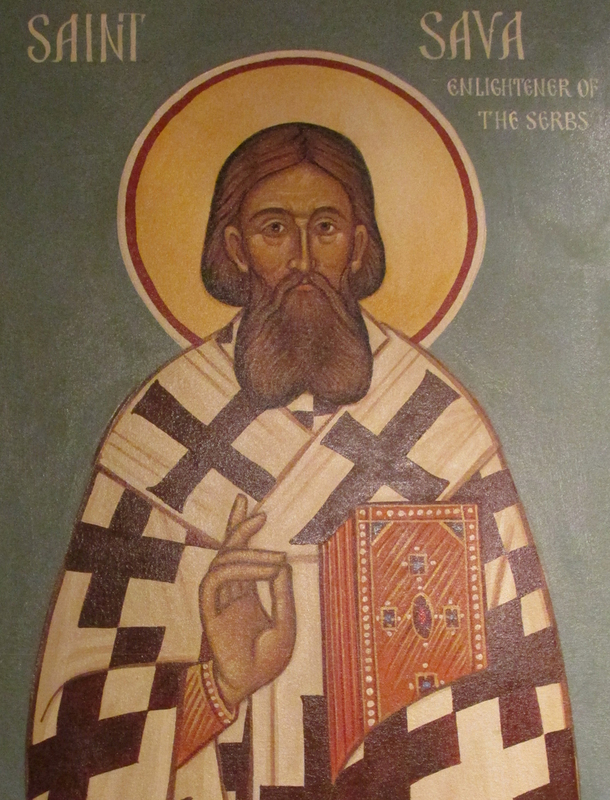 St. Sava, the enlightener of his people, is the most beloved saint of Serbia. A deeply pious monk, who lived to serve God alone, he established the autonomous Serbian Orthodox Church, gaining its independence from Constantinople, and was its first archbishop. He built monasteries, churches and schools. He gave an Orthodox Christian soul to the Serbian people, and thus created the Serbian state and Serbian culture. Filled with the peace of God within himself, he made peace between his two older brothers and between Serbs and their neighbors, bringing peace to all the Balkan peoples. Saint Sava was born in 1169, the third son of the great Serbian leader, Grand Prince Stefan Nemanja, and in Baptism was given the name ‘Rastko’ (meaning to grow). As a youth he received the best education possible. As a young man he yearned for the monastic life, and thus, at the age of 18, he ran away from his parents, (who had arranged to have him married), to the Holy Mountain—Mount Athos. Here the young prince exchanged his princely garments for the monastic garb, and was tonsured a monk, receiving the monastic name, Sava (Savva). At first he lived at the Russian St. Panteleimon Monastery, and then moved to the Greek Vatopedi Monastery. With rare zeal, the young monk followed a strict ascetic life, humbling himself in obedience, seeking to be the servant of all. Eventually the monk Sava’s parents not only accepted their son’s monastic life, but also followed their son’s example: his mother became a nun and his father—who had been a great warrior and powerful ruler of Serbian lands—stepped down from his throne and gave it to his younger son, Stefan, and was also tonsured a monk—at the Serbian Studenitsa Monastery. After a few months, he finally gave in to his son’s entreaties and moved to Mount Athos, where he lived as the simple and humble monk Simeon. Father and son decided to build a monastery for Serbian monks: and the famous and influential Hilandar Monastery came into being. It has been a vitally important Serbian monastic and spiritual center on Mount Athos ever since, and the monk Simeon lived here, until his repose in 1200. After Simeon’s repose, Serbia deteriorated, as Sava’s brothers made war against each other. Thus, in 1204 Monk Sava departed Mount Athos, having been ordained and elevated to Archimandrite, and brought his fathers’s relics—from which myrrh flowed—to Serbia, and reconciled his two brothers over their father’s body. Then the Serbian state again grew strong. Sava buried his father’s body at the Studenica Monastery, of which he became abbot, and gave himself over to missionary work among his people. But the political and religious situation got progressively worse in Serbia, due to the invasion by Roman Catholic crusaders and papal influence. The Serbs did not have their own bishops and priests to protect them from false teachings and to lead them in the true Faith. Therefore, in 1219 Sava went to the Emperor and Patriarch of Constantinople, and begged them to grant independence to the Serbian Church. As a ruler’s son, the monk Sava was well-received, and his request was granted. The emperor and patriarch insisted that Sava be consecrated as the first Serbian Archbishop. He had to give up his desire for a peaceful monastic life on Mount Athos, out of love for his shepherdless people and to lead them in the holy Orthodox Faith. The Archbishop Sava wisely administered the Serbian Church, appointing Serbians as bishops and priests, building monasteries, churches and schools, and teaching, guiding and confirming the people in their Orthodox Faith. He translated the Byzantine Rudder into Slavonic, and this was the basis for civil and ecclesiastical law in Serbia, Bulgaria and Russia. He and his brother built the Zicha Monastery, to serve as the center of both church and state. In 1220 the Archbishop crowned his brother Stefan as the first Serbian king, thus establishing the Serbian state, which was constantly threatened by the neighboring Roman Catholic countries. The authority of St. Sava in the Church and state throughout these years (1219-1236) was of great importance in protecting the Serbs from alien influences. After ten years of labor establishing and nurturing the Serbian Orthodox Church, in 1229 Archbishop Sava went on pilgrimage to the Holy Land and Mount Sinai to renew his spirit. Five years later he decided to go on a second pilgrimage to holy places in Palestine, Sinai, Egypt and the Near East, and, perceiving his departure from this life, appointed and consecrated his successor—a young, but virtuous and most worthy monk, Arsenius. As Archbishop Sava traveled, he confirmed the friendship between the Serbian state and Church with the rulers in the many countries he visited. But it was not the Lord’s will for him to return to his Serbian homeland, for the great Enlightener of Serbia and its first Archbishop reposed in Bulgaria on January 14, 1236. Two years after his repose, Serbian King Vladislav transferred St. Sava’s incorrupt, myrrh-gushing and miraculous relics from Bulgaria to the Mileshevo Monastery in Serbia, where they were buried with great honor. They remained here until the invading Muslim Turkish leader, Sinan Pasha, removed his holy relics and burned them publically near Belgrade on April 27th, 1595. Beloved Archbishop Sava was glorified in 1253.